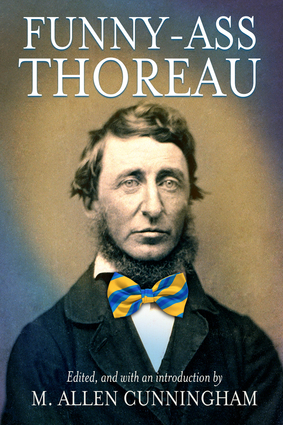 This book presents fans of Henry David Thoreau with a marvelous display of his most underappreciated quality: his killer sense of humor. Amid the transcendental musings of his best known works and the nature descriptions in his voluminous journal, Thoreau was constantly tossing off jokes, whipping out witticisms, and making fun of himself and others. Here he is in his own words trying to wrangle a pig, peeing in the woods, losing a tooth, laughing at Emerson shooing away his own cow, describing the slapstick of snowmelt and mud in the Concord streets on the town's slipperiest spring day, elaborating on his dislike of other men's bowels, and more. Included in this volume is Thoreau's posthumously-published lecture, "Getting a Living," which can (and ought to be) read as a stand-up philosophy routine bristling with one-liners. M. Allen Cunningham is the cofounder of the cultural commentary blog SoulShelter.com. His stories have appeared in many literary magazines including Glimmer Train and The Kenyon Review and have twice been nominated for the Pushcart Prize. He is the author of Date of Disappearance, The Flickering Page, The Green Age of Asher Witherow, The Honorable Obscurity Handbook, Lost Son, and Partisans. He lives in Portland, Oregon.